This time I think we'll be 6 people playing, with some variety in armies. I'll bring my Chaos Marines this time, and I'll be up against Blood Angels, Dark Eldar, Space Wolves, Orks and Imperial Guard. I did make this list long before I knew who'd be coming though, so hopefully my list is good enough to take on all comers. So a quite shooty list this time. With 5 Scoring units I hope to be fine in any objective based game, with the Cultists being on the backfield (starting in reserve), Plasma CSM in the middle, and the other two squads in Rhinos possibly being aggressive or staying in the midfield, whatever seems best. The Lord will join the melta-CSM squad as well, giving them the option to assault stuff. The Chosen will be accompanied by the Warpsmith, adding yet another Meltagun in that squad, as well as flamer for some protection against being charged. He can also help with repairing the Rhino should it get stuck along the way... the plan with them is of course to drive towards the biggest, baddest thing they can find - jump out, blow it up. The turn after they can either charge something (with 2A base, and two Power Axes in the squad they'll probably do well against most stuff) and then be supported by the Dirge Caster on the Rhino, or jump back into the Rhino to go blow something else up. The same plan for the Bikers basically. Might be that I simply run them up alongside each other to present more threats at once forcing the opponent to be disciplined with his shooting. That leaves the Havocs and Obliterators, and their role is pretty obvious. The only thing there is I might keep one of the Obliterator squads in reserve to cause trouble behind enemy lines. Really depends on what I'm up against. I don't think Deep Striking behind enemy lines will do terribly much against Orks for example. And Dark Eldar might be a gamble with their fast ships flying around... Might really help against IG and Space Marines though. My Warlord of the Day! On to the real Fast Attack then! S4 (5 on the charge), Beasts, T4 and 2W and they have Scout. 16 points per model. These seem to be ideal for placing on the board really. They're dangerous enough to actually threaten the enemy, and they're cheap enough that you can take quite a few of them and with to wounds and T4 they'll survive some incoming fire as well while they move up the board. Very straight forward unit. Take units of 10-15 and protect the flanks, support charges, eat Overwatch. Seems very solid to me, and always useful! Everyones favourite unit to hate… now for a completely different reason! So, they changed Lamprey's Bite to replace ALL of it's normal attacks for ONE S5 AP2 Armourbane one per model. Meaning you'll be pretty good against AV12 or less. Above 12 it starts to get a bit iffy. Now, having AV12 or higher in Rear Armour isn't very common though… but anyway. They also are jetbikes with a Slashing attack for turbo-boosting over enemies. So, being really fast, and being able to do some damage while moving… but lacking much punch in assault I see them as a unit with which to quickly locate weak enemies and finnish them off. Or if you're playing stuff like Artillery or Devastators they could slash their way across his army, and then charge. WS3, is a tough one though - because do you chose AP2 and get 4,5 S5 hits for a full unit of 9, or do you chose 18 hits at AP- with S4 for the same unit? Neither choice is that great really… but if you chose your targets wisely at least you'll be able to stop a shooty unit to shoot for a couple of turns. Oh, and for the record - I'd probably go with normal attacks on the charge turn, and then switch to AP2 ones for further turns. So a tricky unit to use, as they'll get really crippled with a bad match up. So anyway, their upgrades are mostly focused on making them hit a bit harder since they obviously all ready have survivability. You can give them a 12" poisoned range attack, as well as chose between Poison (3+) or one Instant Death per model in combat. So you need to chose your prime target here obviously, as you can't take both. It feels like Poison (3+) and the shooting attack is usable in more situations and go better together… but that's also an additional +10 points per model. Which is a lot. But if you have the points… otherwise I'd stick with one of the three options only. You can however upgrade them to follow a specific God, but that makes them more expensive (7-8 points per model). I can't think of a single reason to make them Daemons of Tzeentch or Nurgle. 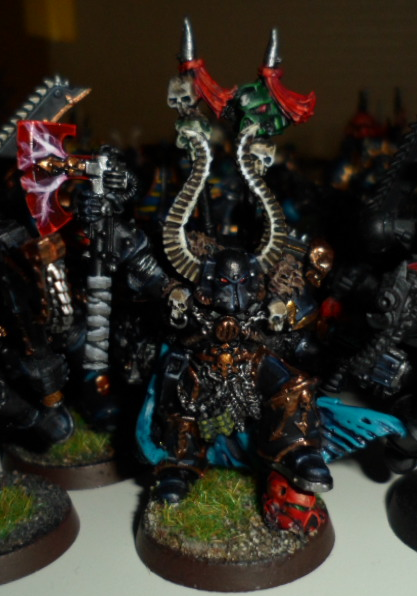 Khorne however gives them Furious Charge and thus S5. Now they could go Transport-hunting and have decent chances against back armour 10. Slaanesh grants Rending - and as such a similar role there as well - and maybe, just maybe you could throw them at a unit of Terminators and hope to thin them out a bit before your real unit is ready to deal with them. For three points more than a Daemonette you get a Daemonette that moves twice as fast with one more attack. So basically you can do everything you can do with Daemonettes (except grab objectives) with this unit, just you'll be mobile. More mobile is a good quality for a unit carrying a Icon… This Icon could also be the Rapturous standard, if you should want to support another unit in assault once per game. Not a bad idea I reckon, as you can't score with them anyway (unless it's The Scouring). The other thing they can do that Daemonettes can't is Outflank with Acute Senses. That is very much situational however. But if you join a Herald with them, or roll a Reward for the Champion like the Hellfire Gaze or Corrosive Breath you might want to get that side-armour shot I suppose. They are now a glasshammer unit. I mean, they were fragile before but now even more so. The way I see it they're too fragile to be deployed normally, so you should Deep Strike them to give them some protection. And that makes them an excellent unit to use Instruments with, as they'll be able to pull more units with them. This is of course a dual purpose, because Bloodletters on their own will die very quickly so if you give the opponent something else to worry about the Bloodletters might actually reach combat... Once in combat they're actually not bad at all with 2 S5 AP3 attacks each on WS5. They of course suffer from no grenades, but if you have the big Cannon of Khorne you can get around that (which is true for everything in the army so won't write this again). What would be a good squad size then? 10 models are cheap - but really, if you expect them to do some fighting you'll need more. But again, they can't be alone. Because a unit of 20 Bloodletters is actually scary to be charged by - so they'll probably get a pretty high priority to be killed as an easy target. However - if you DO have something else that's scary to support them then it's totally worth it to take those wounds to make sure the other thing reaches combat. Or if not, you'll have plenty of Bloodletters reaching combat. Even 5 Bloodletters will do quite well against MEQ, but T3 means Bolters will absolutely slaughter them. I'd not go below 15 per unit if I want them to fight as well. The last option you have to consider is the Bloodreaper, and what Rewards to give him. He can take 1-2 Lesser Rewards or 1 Greater Reward. Depending on what you want him to do I see all three options as quite viable. First, 1 Lesser Reward. Here you're Hoping for Warp Strider to get that +1 to Reserves making sure you come in Turn 2 with your Instrument. Corrosive Breath might be okay as well if you'll be facing a lot of Transports - giving the unit to de-mech something in the Shooting Phase at least (but even if they manage they can no longer charge the insides due to sixth edition as far as I can tell). If you fail to get that you might as well exchange it for the Etherblade (I prefer it over the Blood Axe, thanks to Master-Crafted). That's a unit champion with AP2 - something to actually threaten enemy HQ's. If you go for two rolls you'd like Cleaving Strike and an Etherblade. AP2 and S9 on the charge at normal I. That's pretty nice for 25 points extra. Corrosive Breath and Warp Strider might of course still be useful. And maybe Spell Breaker if you know you'll face a lot of psykers. Or if you instead go for the Greater Reward you'll end up with an defensive option. You'll be looking for the armour, re-roll invuls or Feel no Pain first hand here - so you can put this guy up in front and try to soak up some wounds with his better save. I don't feel like the Touch of Uncreation is very useful on this model, and the Hellfire Gaze is situational - so might as well replace those with a Greater Etherblade (The Blade of Blood is Unwieldy! Yuck!). So, the Herald is basically a better version of the Bloodreaper and thus what I wrote above applies to him as well. He has the additional option of taking one Greater Reward (for defence) and one Lesser (for an Etherblade) as a combination of the two. I don't see much reason to take three Lesser Rewards. He could also instead take one Exalted Reward - but all of those are better suited for Monsters basically - so the only reason I see them doing that is to take one of the Artefacts. I cover those in this post. The Eternal Blade is non-sensical for the Herald of Khorne, being AP- when his Hellblade is AP3... might be used by an MC but not a Herald. The Portalglyph I feel is not ideal for the Herald of Khorne as he'll probably be upfield. The Grimoire might sit here, as you're likely to be close to units that needs the boost. And the Bloodstone might be okay here as well, all though the Herald is somewhat fragile. So, that brings me to the options that made me put this in the Troop-review. The Locus. Being able to boost his entire unit makes it so that of course you want to put him in a unit. Not only does he grant extra Ld for stability but Locus to boost... Abjuration doesn't seem much worth it, Fury however might be very useful as it gives the unit Rage. However, you have to chose between Rage and Hatred... it's a tough choice really. More attacks, or more hits? I'd consider the size of the unit here - small unit, Rage and large unit Hatred. It really comes down to how many points you spend, and I think both options are very much valid. Khorne also has this odd option off putting the Herald on a Blood Throne giving the effects to an aura of units isntead of just one unit... tempting - but also more risky. The Chariot isn't super durable, so is quite likely to be brought down in one round of shooting anyway. Putting the Herald in a unit seems safer. All of the above can also be used when putting the Herald on a Juggernaut and attaching him to Bloodcrushers instead. Okay, this is a very strange and unusual unit. It's the first unit around with Brotherhood of Psykers - and that's where all their attacks are. They roll one power from the Change lore, and their warp charges are determined by their unit strength. So you probably want to take at least 16 Horrors. As that's the minimum for Level 3. Taking any more just give additional wounds before you lose one D6 shooting attacks for the Change Primaris power. I can't really see any reason why you'd take Tzeentch's Firestorm over the Primaris really, especially not with Horrors. The Bolt of Change and Infernal Gateway however have some good potential - but on average are just decent anti-tank. The problem with those I feel is that you're dedicating a full 16+ squad to one single attack with one single purpose. Seems a bit like a waste to me. Anyhow, all the ranges are 18-24" so a midrange unit that doesn't want to get charged. Means they'll probably feel good sitting on top an objective inside terrain in the middle somewhere. Oh, and despite being shooty they can't fire Overwatch as their only attack is Psychic Powers. I guess they got the Blue Horror special rule to compensate for that (extra attacks that auto-hits for each Horror that dies). Which makes them quite different from other Shooty units to say the least. Icon or no Icon? They're not super resilient - but thanks to re-rolling failed saves on 1 they do have better save than others. And they do want to sit midfield so might be a good place to sit with an Icon. And their special Icon gives them the chance to fire extra shots once per game. I wouldn't say ideal, but could work. And Deep Strike or deploy? I'd say either works here as well - kind of depends on the board. The Champion has no real need for Lesser Rewards (as those are killy in close combat mostly, and you certainly don't want to be in combat) and as such one Greater Reward to help protect the unit is the only choice I see if you actually want him. I think I prefer to keep the unit cheap though. Lets start with the Locus here. Both the Lesser and Greater Locus are kind of "in case we get charged". Not really super-useful in my opinion. To compensate however, the Exalted Locus is awesome indeed. +1S to all psychic powers manifested by this unit? Making the Primaris S6? I'll take it! On to Rewards then. This is different than for the Horror-champion - because you can put the Herald on a Disc of Tzeentch making him a Jetbike. Now you have the possibility to go and snipe characters with your newly found AP2 weapon. It's quite cheap, and as he's on a jetbike he'll be hard to avoid. You might also catch your opponent off guard. I mean, this is a puny spellcaster isn't it? Wouldn't expect it to go character hunting! Talking of spellcasting. This guy is a Level 1 psyker and can be upgraded to Level 3. And you have access to Divination. If you just want a cheap buff character for your Horrors simply add the Locus of Conjuration and take Prescience for your psychic power. 70 points and your Horrors are now a lot more lethal. If you want to complement the Horrors with the primaris you could go Level 2 and roll once for Change as well to get one of the higher strength shots. With the Horrors shooting at S6 you'll be able to share a lot of targets anyway. At the moment I'm not sure I can think of a good reason to go Level 3 with this guy however. Maybe if you put him in a Chariot (for protection) and zoom around to cast buffs on your army. That'd complement the Grimoire as well I suppose. Anyhow, you don't want to Deep Strike these guys as they're Slow and Purposeful and thus can't run to spread out when they arrive. So not much need to consider an instrument. The special Icon gives them extra offensive power, which I feel is not their role so I wouldn't bother with that either... a generic Icon to help with Deep Striking might be in order though. Like I wrote above, I don't feel like these guys are meant to be offensive - but that doesn't mean they're easy to kill in combat. They're actually quite good at killing stuff themselves with their S4 and Poison (4+). The poison makes them surprisingly good at killing monsters obviously. Another surprising addition to the Plagueswords are that they're always glancing on 6's (unless they'd penetrate normally). Which means a full unit of 20 is going to glance a Land Raider to death on average in one turn. Odd! It is still defensive to me though, because that'll help them defend against Ironclads or other Walkers that are coming to your backfield and trying to clear out your objectives. So yes, they can hit - but it's more like a response to being threatened rather than attacking. So with that in mind I wound only consider the Champion for a Greater Reward and thus a Defensive gift to help shield the unit. The Nurgle Herald I think, is the one that feels like it's even more made to go with Plaguebearers than the other Heralds. Why? The Greater Locus gives them Feel no Pain. The other two Locus are offensive, and as such I wouldn't really consider them (unless you're going pure Nurgle perhaps). You could basically take that and be done in my opinion, but there are some other options as well. Again, Greater Reward and/or a Palanquin to help with shielding... but if you're giving your unit Feel no Pain you probably shouldn't stand in the front where you'll die first so... chose one or the other. Being slow makes it hard to be offensive, and so most of the other Rewards aren't that amazing for this guy I think. I mean, you could kit him out and hope that the enemy comes to you and that'll certainly work against some armies but it's also potentially spending points that'll never be used... And sadly you can't make the Herald faster so he could join Plague Drones (and not slow them down). I do feel that the Nurgle Herald would be excellent for the Portalglyph though, he's all ready sitting on the backfield so you'll get the portal back there as well which should suit you just fine. Another option is to make him a psyker. You can go up to Level 2, and have access to Biomancy and Plague. If you go Level 2 and roll both on Biomancy and combine that with some offensive Rewards you can actually make a quite beastly combat character. Especially if you also have the Palanquin. But as above, your problem is reaching combat so not to sure about how good of an option that is. The other option is more interesting I think, because it changes the way a unit of Plaguebearers could be used. Because the Plague powers are very offensive and short range - so suddenly it could be viable to Deep Strike them close to the enemy and just unleash some powerful spells. If you also roll Miasma of Pestilence you have suddenly created an awesome unit for tying up dangerous units. When those Assault Terminators need fives to hit they'll start to struggle a bit to get away from all these Plaguebearers in their way... The problem is just that you need to roll a 3 on the D3 for it to really help you against most combat units as Plaguebearers are only WS3 themselves. And while on the subject of tying things up... Enter Nurglings. 15 points per base for 4 wounds and 4 attacks that most importantly can Infiltrate. As they suffer from the same speed problems like Plaguebearers do, and they're not Scoring due to being Swarms... at least they can Infiltrate to make them useful. As long as you stay away from S6 which will Instant Death whole bases you have a cheap unit that can start to tie up much more important units than themselves. Chug them into that Devastator squad to stop them shooting for a round or two. A scoring unit getting close to an objective? Nope, denied! They're not strong enough so that they'll not eventually die... they will die pretty quickly. But the thing is, they're so cheap so you don't care. If your opponent has to waste time to deal with them, you gain from it. If they don't shoot at them, you'll stop him from using a unit next turn and you gain from that too. Yes, they're Swarms and die horribly to Blasts and Templates... but if your opponent shoots his Blast and Template weapons at your cheap little Nurglings the rest of your army doesn't have to deal with it! The one thing that I don't like about them is that they're Troops, and thus take up precious space in your Force Organisation. I don't think the most effective way of building Daemon armies will be to spam out Troops however, so you'll probably be able to fit one unit of Nurglings in anyway (two units might be too many). But I still wish there'd be a way to get them outside of the Force org - like you could take one unit for every Plaguebearer unit or something. That'd make them truly awesome. And finally the last Troop choice. I think these one play much like Bloodletters these days. As you have to take ten minimum there's no more of hiding them to camp objectives. And as such I feel like you might as well take a full squad of 20 most of the time. Because they're still fragile. Now, the difference between Bloodletters and Daemonettes is that Bloodletters hit hard with AP3, Daemonettes hit A LOT. 3 attacks each on the charge with Rending is enough to deal with both Hordes and thanks to Rending pretty decent against Terminators as well. Where the Bloodletters go for quality strikes, Daemonettes simply overwhelm with hits. But that's not a major difference really, so that means that pretty much everything I wrote for the Bloodletters applies to Daemonettes as well - down to deployment and Rewards for the Champion as well as Instruments. One thing to note though is that they're Fleet, and being Slaanesh they run an extra 3" meaning they can relocate super-fast. So the major difference in options compared to Bloodletters is should you take their special Icon or not? It lowers the WS of the opponent for a turn once per game. Not amazing. Worth 10 points? Probably not. The normal Icon for Deep Striking I have the same reasoning as with Bloodletters though. Again, many options are similar to Khorne - for Rewards I'd consider the exact same loadouts but keeping in mind that the Slaanesh Herald is only T3 so using it for shielding might be a bit more risky. On to Locus then, you can give your unit Move Through Cover, +5I or re-roll hits (and some special stuff for Challenges) in combat. All of them are quite good options. Move Through Cover obviously because you're all ready fast and now not even Terrain will slow you down much. Re-roll hits in Close Combat with all those attacks? That'll increase their effectiveness a lot. The +5I is the worst one I reckon, Daemonettes are all ready I5 and the Herald I7 so you'll strike first in most cases anyway - the only use I see for it is if you're facing non-Space Marines and wants to make sure you catch enemies that run away. So a bit situational indeed... The Exalted Locus also have this thing where opponents can't refuse Challenges and you chose who you challenge... Devastating for Orks and other units that depend on their Champion to do damage as you can pretty easily snipe them. High WS and re-rolls to hit... and the possibility for some good weapons with Rewards. Speaking of weapons, I once again prefer the Etherblade over the Slaanesh-sword - and for the Greater Reward you can chose a Lash that is Assault 2D6 and 12" range but Heralds are only S4 and AP-... so not amazing either. But perhaps nice to be able to wither down some of the enemies before charging in, guess it depends on your style. You also have several options for mounting the Herald of Slaanesh. Either you go for the Steed which makes you super fast and Outflanking with Acute Senses. Always a nice option to have, and this way you could Outflank Daemonettes as well for whatever reason you'd want that... probably you put the Herald on a Steed to join Seekers though. Then you have two different Chariots that are basically both the same, one just have 2 more HP than the other. I see this as an option if you want to run Cavalcades and want to give the other Chariots some extra hitting power. Pretty unique for the army really. But I wouldn't bother with a Herald in a Chariot unless I was planning to use A LOT of Chariots - you basically need to form your army around this I think for it to be worth it. And that's it for Troops! Next up is Elites. So lets start with the HQ choices then. There are a lot of them, so I'll actually separate the generic Heralds and write about them in the Troop-section instead because they're more about boosting troops anyway. With one exception, and I'll start with that one. So you can now take 4 Heralds for 1 HQ-choice. And you can actually create a separate unit of them as long as they worship the same God. So in a normal force org-chart this means 8 Heralds. Now, why would you ever want 8 Heralds in a single unit? Consider the fact that you can easily get AP2-weapons with them for just 10 points (or 20 points if you want +1S as well). This unit will rip apart anything in the assault. Granted, they only have 2W each - but this is also easily remedied by simply joining all 8 of them to a Troops-unit for extra wounds. I feel like this is even more deadly for Khorne than others (as it should be). S6 on the charge (7 if you went for Greater Etherblades), 4A each (5 if you add a Locus for one of them to get Rage) at I6. With WS7 you'll hit on 3+ against almost anything as well, and Etherblades are Master-Crafted so you get an additional re-roll to use. You'll land around 700 points (more if you take that extra body guard as well), but nothing will stand up to this unit in the assault, not even Assault Terminators or Wraiths. Ah, the Fallen Bloodthirster. 8 S7 AP2 attacks with Hatred and re-rolls to wound with instant death on the charge. This guy is obviously excellent against those 2W-units that are around like Paladins and Nobs. Those tend to be quite elite as well, so he'll probably just wipe out such a unit in one round. Unless he gets challenged of course. But! The thing with him is that he also gives Rage and Hatred to everyone within 12", so you'll want to surround him with other stuff anyway - and that way you should be able to charge another character in with him just to take care of challenges to make sure you get all the devastation you deserve. His big problem though is that he's walking which makes him quite slow. Normally you'd consider a big guy like him to deploy on the board as he'd be one of your more resilient units - but then you risk not getting him into combat for quite some time. So a better idea is probably to Deep Strike him off an Icon to make sure you get him where you need him. He's actually quite cheap for the amount of pain he can dish out as well, but he also feels like a trap. If you miss-use him you'll be punished for it. The once obligatory Fateweaver! But no more, he changed quite a lot. If you take him now it's because he's one of the most devastating Psykers around. However he takes some trickery to make work as well - as you don't have access to all of your powers all the time - but you have to chose which ones will be active for every turn. Unfortunately this means you'll have to chose between Divination and Biomancy as you can't have both active the same turn - so do you go for offence or defence? And as you only generate one power each from Divination, Biomancy, Telepathy and Pyromancy you must have some luck as well. Sometimes you'll get really nice combinations - sometimes not so much. The only thing that's for certain is that you'll have access to a lot of witchfire (Lore of Change) which you can fire two each turn (since he's a Monstrous Creature). And for everything you hold dear, don't get him in close combat. Really. He should be flying around at all times, casting spells. WS1 and A1... just don't. Even if you get something like Warpspeed in Biomancy it's not worth it. He also gives you re-rolls for the Warpstorm table as well as an additional dice to re-roll per turn. Quite useful skills to have of course, and if you use that re-roll smartly it'll keep you on top of things. Like for instance when you really need this one thing to die. However I feel like he is very expensive for what he does. So many things are very situational. What powers do you roll? Because the Change-lore isn't all that exciting really. But I also feel I need to playtest this guy before judging. But on paper he doesn't look that appealing to me at least. A Great Unclean One that heals Nurglings. For 260 points. Yeah sure, you get a poisoned (4+) Large Blast with AP3, but it only has 24" range. And he's a psyker, but has to take his one power from the Plague lore (which is not bad, but a normal Great Unclean One can take Biomancy...). I really don't think he's worth it, I'd much rather go with a generic Great Unlean One which is a lot more adaptive. Ah, the Bloodthirster. Basically the same thing that I wrote for Skarbrand. Except that this guy has wings, which is a huge advantage. He used to be S8 base, which was awesome for Vector Striking flyers, now he's only S6 sadly. But to compensate he has gotten a S6 AP2 lash as well, with a 12" range. At BS10 with Skyfire. It's not amazing, but if you combine it with Vector Striking, and flying past the Flyer so you get Rear Armour you actually have a decent chance of doing some damage to it. You could also buy a Greater Reward and hope for Hellfire Gaze, which is a S8 AP1 Lance-weapon. With BS10. However there's no sure way to get that, so sometimes you'll have it and sometimes not. Now, the Exalted Reward are all amazing for this guy. I'd buy that every single time. And if I somehow got something that was bad for this match up... I'd simply pick the Portalglyph instead. Or the Grimoire, depending on my other characters. But even so, all options on the Exalted Rewards helps a lot. So, I'd say take one Exalted and one Greater Rewards for him. You'll get a multi-purpose model for 300 points, that'll be able to do almost anything. Totally worth it. The second flier. As you'd expect this guy is more shooty than the Bloodthirster though. For anti-flier he can do pretty much the same thing as the Bloodthirster - but in his case the Exalted Gifts aren't amazing (because you don't necessarily want to be in combat with this guy). So instead I'd probably take two Greater Rewards here, as for those you have a 2/3 chance of getting something defensive (thank you very much) and 1/6 chance to get better anti-flier and 1/6 to get Fleshbane+Armourbane (which you don't care one bit for with this guy). If you have the points, then a Lesser Reward might be worth it as well, but I'd not consider it necessary. So the only option left is to Level 3 or not to Level 3? You have access to Divination and Change, and in Divination you want Prescience, and in Change there are just a lot of shooting attacks. You can only shoot two per turn, and if you get the Shooting Attack for your Greater Reward then you only have one Power left to cast, so I'd say 25 points for Level 3 isn't needed most of the time. Even though it could be helpful from time to time. T7 6W with access to Biomancy. He is slow though, so you will need to Deep Strike this guy, much like Skarbrand. Even more important for him as he can't even run. So obviously he'll be able to take a lot of hits, but he's quite decent at giving out as well. What makes him really special is of course that if you get the good powers with Biomancy he's suddenly very resistant to the stuff that is usually very good at monster hunting. So if you have more big guys than one, he'll be able to keep the others safe by tying up the dangerous stuff (and possibly eventually killing them). And the last of the Greater Daemons then. It's also the cheapest Greater Daemon base, but as you should give it some Rewards and possibly Psychic Powers he'll get as costly as the others. He has a pretty scary stat-line actually, with a lot of high strength attacks on the charge. But even so he can also have a bit more supporting role with his psychic abilities. The Excess lore is quite supportive in nature, and can be combined with Telepathy. Oddly those two have very much in common so... I don't think I'd usually make him Level 3, but Level 2 is probably enough. Rolling one on Excess and one on Telepathy hoping to get two powers that complement each other. Or just skip that and roll once on Telepathy. Because the thing is, the power I like the most in Excess is giving the enemy -5I and can't use Counter-charge, which is a great support power - but the Keeper himself doesn't need it (he's I10!) and as he's on foot he might not be where it's needed. So instead going for Telepathy where I know I can always get Psychic Screech at least feels safer. And for Rewards, he's quite assaulty so I'd go for the same set up as for the Bloodthirster - 1 Exalted and one Greater. But for a different reason (well the Exalted is the same), as he's not flying those defensive Greater Rewards would really benefit him. So, this guy has now moved to the HQ-section. And you can customize him a lot. Basically you can make him emulate any of the Greater Daemons (or even a combination of two) to suit your needs. So just take everything I wrote for the Greater Daemon and pick what you like and start applying to this guy. What is more important however, is that each Greater Daemon of a specific God makes Daemon Princes of the same God into Heavy Support instead of HQ. So if you want to build a Monster-army, this is your chance... and as you can combine skills with the Daemon Prince you can probably make them support each other pretty well. I think I'll just leave it at that. So a few words about the Named Heralds then! The only character in the book with Eternal Warrior. And it's on a 2W character... At least you can take a Juggernaut and make him 3W. But still. He's basically just a Herald of Khorne that you can't customize as much, with one more attack and better WS as well as I. Doing Instant Death on 6's. 145 points with a Juggernaut. Not sure he's really worth it. The hound of Khorne! Quite though actually, now that he is an HQ. Really fast (Beast) and T5, which is designed to kill the enemy Warlord pretty much. He gets re-rolls to hit and wound against a chosen enemy character, so that's obviously where you want to use him. All though he has Hatred as well, so will do fine against everything else as well. As a bonus he also causes nearby Psykers to get Perils more often (every roll of a double within 12" of Karanak). He also has Scout, which might be useful if you join him with some Bloodcrushers and deploy them instead of Deep Striking. They'll also have the same movement so they'll be able to move together easily. Perhaps my favourite unit from the old codex... now an HQ! Basically just a Herald of Tzeentch which is forced to take his one power from the Change lore and can borrow an opponents stats for a turn. For 75 points. A bit meh. A super random character this time around. Each turn you chose a lore from the rulebook and randomly generate a power. Then you use it without rolling for it. Depending on what you roll it can be really powerful, or really useless... They also have the ability to steal Warp Charges from enemy Psykers to give to your own Psykers. I don't see them as terribly useful, but more a fun unit. Well, the Tallyman of Nurgle has lost a lot of usefulness. He is a (very) expensive Herald of Nurgle that will eventually start boosting his bodyguard with various benefits. The funny thing is of course that once you reach the max-tally a unit of Plaguebearers are basically back to what they used to be in fifth edition before the Tally was applied. Heh. No, I'd rather take three Heralds of Nurgle for just slightly more points. This character has changed a lot as well. What hasn't changed is that she's still not an Independent Character - making her extra fragile. She's a T3 model standing by itself! Easy kill! But, she has got something to improve her survivability at least, as now she re-rolls failed invulsaves and have Hit&Run, making it so that you can probably control when you're in combat and can't be shot at. So that's something at least. But the major change is of course her dances. Each Shooting Phase you chose a dance. This dance will cripple a unit of your choice within 12" of the Masque. They will either suffer -5WS and reduced mobility, or -5BS (to a minimum of BS1) and can't fire Overwatch or the unit take it's own numbers in S1 AP2 ignores cover automatic hits. In other words, she's an excellent supporting unit. That's some really, really good abilities. There's a downside though. She's not listed among the Heralds, and as such might not be part of the 4 Heralds for 1 HQ choice... Hopefully we'll get that FAQ'd soon though, and hopefully she'll be included in the list. Because all though powerful, you are sacrificing other strong choices if you take her. But if she really is an HQ of her own, then I suppose she'll work alongside 4 other Heralds with no big guys in the army. Well that's it for HQ (except Heralds that I'll include in Troops). Very many interesting choices. I feel like this is one of the most important decisions you make when making a Daemon army with this books, as the different choices really change the way you'll have to build the rest of the army and how to play it. And that's a great thing indeed. I really love the fact that you can get away with a single HQ choice for 45 points as well. Now, this opens up even more variety as you'll have access to more Troops in lower point games which is awesome. It gets even better for taking Daemons as allies as well.